Happy Chinese New Year! Gee…. it's a lot like Scottish Hogmanay! A very multicultural group of poetry loving revelers shared food and drink at Library Square Pub on Chinese New Year's Day. Two international students from Brasil joined us along with Karen, a man from Iran, 5th generation Vancouverite Todd Wong, born in Scotland June Ventners-Clark, Peter Clark, Phoenix and Sherry Shigasu. After the World Poetry Gung Haggis Fat Choy Gala at the Vancouver Public Library, some of us went to the Library Square Pub. Monday night appetizers were 2 for 1. We had nachos, spring rolls, popcorn shrimp and chicken wings. Our multicultural crowd counted ancestry from around the world: Brazil, China, Japan, Scotland, Iran, Germany, India and more! 1) Make lots of noise. Chinese light firecrackers to create loud noises to scare away bad spirits. Scottish also create loud noise by clanking kitchen pots and setting off cannons and church bells. Doors are opened to let out bad spirits. 3) Have lots of good food and visit friends. Eat lots and be merry. Both Scots and Chinese enjoy eating, hosting their friends and visiting their friends. If you spend all your time visiting friends, then you don't have to cook for anybody. But good guests always bring good gifts too! This entry was posted in Asian Canadian Cultural Events, Cultural Fusion, Food & Restaurants, GHFC World Poetry Night, Literary Events, Main Page, Multicultural events, Robert Burns & Burns poetry, Scottish, Gaelic, Irish Celtic events and stories, Wine, spirits and beer on January 29, 2009 by Todd. 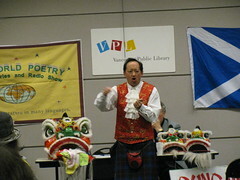 Monday night was the 6th Annual World Poetry Gung Haggis Fat Choy Gala. This event was first created when I noticed there were no readings of Robbie Burns at the library… I contacted Ariadne Sawyer of the World Poetry Reading series to collaborate for this now popular program. Just before our 7:30 start time, I chatted with the audience, explaining the origins of Gung Haggis Fat Choy, and sharing some of the events that happened the night before at the big Gung Haggis Fat Choy dinner, and at our small ceremony at the Robert Burns statue in Stanley Park – to celebrate the 250th Birthday of Robbie Burns. We bring together the elements of Gung Haggis Fat Choy within a world context. We feature poetry of Robbie Burns, China, as well as contemporary Scottish-Canadian and Chinese-Canadian poets. And sometimes we add in music and dance and of course… singalongs. This year's program was a lot of fun. It was hosted by Ariadne Sawyer, Diego Bastianutti and myself. We featured poet James Mullin and myself reading poetry by Robbie Burns. I also brought my accordion to play some tunes too. a poem by Pablo Neruda, which Diego read in Spanish afterwards. 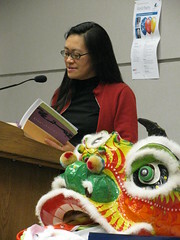 poems about food and celebrations.I talked about some of the similarities about Chinese New Year and Scottish Hogmanay. James Mullin led a group of four volunteers to dance my parade dragon around the room while I played “Scotland the Brave” on my accordion. There were a number of Korean ESL students in the audience, and they really had a lot of fun. Evrerybody really got into the spirit of the evening. This photo features poets James Mullin, Tommy Tao along with a Korean language student and Peter Clark originally from the U.K. 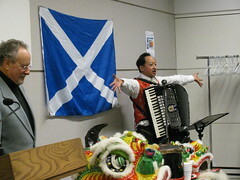 This entry was posted in Accordions, Asian Canadian Cultural Events, Cultural Fusion, GHFC World Poetry Night, Literary Events, Main Page, Multicultural events, Music, Recent Reviews, Robbie Burns Day, Robert Burns & Burns poetry, Scottish, Gaelic, Irish Celtic events and stories on January 29, 2009 by Todd. Our group of Burns celebrants included bagpipers Trish and Allan McMordie (very rear), members of the Burns Club of Vancouver, members of the Centre for Scottish Studies at Simon Fraser University, some visitors from Scotland, and lots of Vancouverites included myself. Three television cameras from CBC, CTV and Global came out to film our little ceremony. Friends would later report that they saw me on the evening news on Sunday. 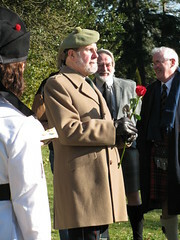 I had never before attended a “wreath laying” at the Robbie Burns statue. 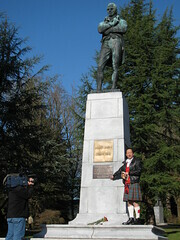 In fact, I had never before visited the the Robbie Burns statue on Robbie Burns Day. Often, I simply passed it, as I drove along Georgia Street enroute to the Stanley Park Causeway and Lion’s Gate Bridge. When I arrived just before 12 noon, there were already some bagpipers playing tunes in front of the statue. Surprise! It was Trish and Allan McMordie, of the JP Fell Pipe Band from North Vancouver. It was exactly one year ago on Robbie Burns Day, when Allan and I first met at the Rock 101 Bro’ Jake show. 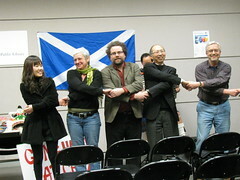 Allan also came to Vancouver City Hall, when I received the City Proclamation for Tartan Day, and we created a photo op with then Mayor Sam Sullivan, and councilors Heather Deal, George Chow, Tim Stevenson, BC Lee, Kim Capri. 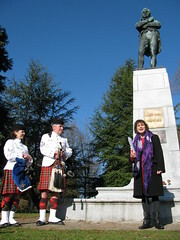 See: Tartan Day (April 6) proclaimed in City of Vancouver, April 3. My friend Stuart Mackinnon, newly elected Parks Commissioner, was there with his doggy companion Kiku. 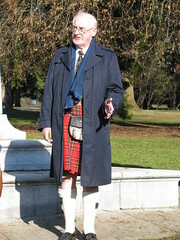 Stuart was dressed in his kilt and sweater ensemble. To see Stuart this past week, at the VDLC and Gung Haggis Fat Choy Burns suppers, you would think he’s been wearing kilts all his life – but it’s not true. He only started wearing kilts less than 2 years ago, after he joined the Gung Haggis Fat Choy dragon boat team. Ray Eagle sang “My Luv is Like a Red Red Rose” and I put a red rose into his hand, to the delight of the crowd. 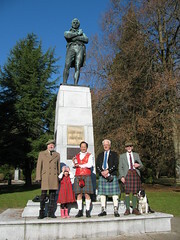 Robert Barr of the Burns Club of Vancouver, talked about how when the Robbie Burns statue was put up in 1929, it was the first statue in Vancouver, and a thousand people came to watch the statue unveiling by J. Ramsay MacDonald, Prime Minister of Britain, on 25th August, 1928. Here’s the bottle! 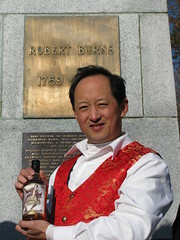 It was auctioned off that evening at the Gung Haggis Fat Choy: Robbie Burns Chinese New Year’s Eve Dinner for $750 CDN. Half of the funds will stay in Vancouver, and half will go to Scotland’s National Trust to help sponsor the Chinese punch bowl that Robbie Burns used at his brother Gilbert’s wedding. Check out the rest of my pictures on Flickr. 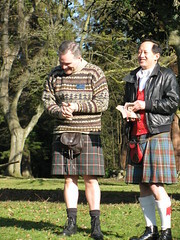 This entry was posted in Kilts - wearing kilts, Literary Events, Main Page, Multicultural events, Robbie Burns Day, Robert Burns & Burns poetry, Scottish, Gaelic, Irish Celtic events and stories, Todd Wong, Vancouver Area Adventures, Vancouver Heritage and History, Wine, spirits and beer on January 29, 2009 by Todd. Macleans Magazine cites Gung Haggis Fat Choy's Todd Wong in article about the intricacies of Haggis for Robbie Burns' 250th Anniversary. It was last week when Pamela Cuthbert phoned me up for her story in Macleans Magazine. She had heard bout the Gung Haggis Fat Choy dinner and that we served up deep-fried haggis won ton. “Won Ton is the Chinese equivalent of the Mars Bar,” I joked, making reference to the Scottish predeliction of deep-fried Mars chocolate bars. I explained how we came up with the idea to create haggis won ton, and told her about the first time we tried haggis won-ton soup. “We spit it back,” I exclaimed, “It was way too haggis-sy. But the deep-fried haggis, and the haggis spring rolls were great. Today at the Floata Restaurant we will also be serving up haggis & pork su-mei dim sum dumplings. Everybody remarks that they've never seen people eat so much haggis, especially when they roll the haggis up with the lettuce wrap, with Chinese Hoi-Sin bbq sauce. It's delicious! Check out the article below – I am mentioned in the 3rd paragraph. Click on the link to read the full article. It’s the 250th anniversary of Robert Burns’s birth: deep-fried haggis won ton, anyone? promising more invention and revelry than ever. This entry was posted in Cultural Fusion, Food & Restaurants, Gung Haggis Fat Choy dinner, Gung Haggis Fat Choy DINNER 2009, Main Page, Robert Burns & Burns poetry on January 28, 2009 by Todd. 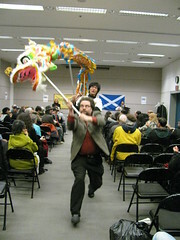 What is the “Best Photo” from Gung Haggis Fat Choy 2009 Dinner? Time for a photo contest! Barnes… courtesy of the Royal BC Museum – photo Lydia Nagai. (Performing Arts Lodge Vancouver – where Deb works). I am thinking of creating a photo contest for Gung Haggis Fat Choy. You can vote on the pictures of our 3 official photographers… or submit one of your own. I think this picture captures the “Spirit of Gung Haggis Fat Choy.” It has elements of Chinese, Scottish, Robbie Burns and BC multicultural/intercultural history. How can you argue against Klee-wyck (Emily Carr)? Okay… the only thing missing from this picture is the haggis and the scotch drink. Check out the photo sets by our official photographers. then send me an email and vote! We do have some prizes to give away!!!! 661 – 20090125 – Robbie Burns’… – Patrick Tam photo set. 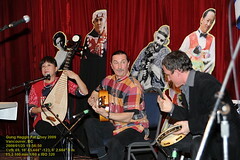 Gung Haggis Fat Choy 2009 – Linda Nagai photo set. This entry was posted in Gung Haggis Fat Choy dinner, Gung Haggis Fat Choy DINNER 2009, Main Page on January 28, 2009 by Todd. Gung Haggis Fat Choy is always a wonderful event for photographs. Special thanks to our incredible photographers Patrick Tam, Lydia Nagai and VFK. If you like their photos, please contact them and purchase them. We have asked them to put “water marks” on their photos, so that we will advertise and promote them. They help us with our event, because they believe in the community work and social consiousness raising that we do. spent 2 weeks in Scotland for Homecoming Scotland! of Burns' Address to A Haggis. immortal address by Dr. Leith Davis – that knocked the audience over! With wonderfully warm co-hosting from Gloria Macarenko and Catherine Barr…. And strong support from stage manager Charlie Cho, and sound technician Carl Schmidt. We will have some pictures available for you soon. This entry was posted in Asian Canadian Cultural Events, Bagpipes, Canadian Identity, Canadian Identity & Heritage, Chinatown Vancouver, Chinese Canadian History, Cultural Fusion, Food & Restaurants, Gung Haggis dragon boat team information, Gung Haggis Fat Choy dinner, Gung Haggis Fat Choy DINNER 2009, Hapa culture, Kilts - wearing kilts, Literary Events, Main Page, Multicultural events, Music, politics and politicians, Robbie Burns Day, Robert Burns & Burns poetry, Scottish, Gaelic, Irish Celtic events and stories, Theatre, Todd Wong, Vancouver Area Adventures, Vancouver Heritage and History, Visual Art and related events, Wine, spirits and beer on January 28, 2009 by Todd. Our Gung Haggis volunteers are incredible, and we know we can rely and trust on you to make whatever needs to happen… happen. At the event, the volunteers provide foundation, to help get the event ready, so everything can flow. that come along with Gung Haggis Fat Choy community events. Burns Suppers and events…. What a compliment for all of us. The theme for last night seemed to be abundance. an abundance of scotch – thanks to Famous Grouse sponsors. an abundance of media attention, through radio, tv, newspapers and blogs… and even Macleans Magazine! And an abundance of raffle/silent auction and live auction monies! But more importantly is an abundance of community spirit. This is what the Gung Haggis dinner event is based on. This is what the Gung Haggis dragon boat team is based on. seatings…. and so much more. This entry was posted in Main Page on January 27, 2009 by Todd. The 2009 Gung Haggis Fat Choy: Toddish McWong's 250th Robbie Burns Birthday Chinese New Year's Eve Dinner was a big success – worth 2 ceremonial haggis. With wondefully warm co-hosting from Gloria Macarenko and Catherine Barr…. And strong support from stagemanager Charlie Cho, and sound technician Carl Schmidt. This entry was posted in Bagpipes, Canadian Identity, Canadian Identity & Heritage, Chinatown Vancouver, Cultural Fusion, Food & Restaurants, Gung Haggis Fat Choy dinner, Gung Haggis Fat Choy DINNER 2009, Kilts - wearing kilts, Main Page, Music, politics and politicians, Robbie Burns Day, Robert Burns & Burns poetry, Scottish, Gaelic, Irish Celtic events and stories, Theatre, Wine, spirits and beer on January 27, 2009 by Todd. James Mullin and Rita Wong. Performances: Ji-rong Haung, Chinese erhu. All are invited for this fun event! Dr. Sun Yat Sen Gardens celebrates Yearof the Ox on February 1st. In Vancouver Chinatown, the Chinese New Year Festivities always take place on the first Sunday following Chinese New Year Day. This year, Chinese New Year Day is on Monday, January 26th…. so on Sunday February 1st, come to Vancouver Chinatown. One of my new favorite activities starting last year…. is to visit the Dr. Sun Yat Sen courtyard at the Chinese Cultural Centre because my friend Qiu Xia He of Silk Road Music is organizing a special Cultural Olympiad show for Chinese New Year. Last year, I was fascinated by the show, which brought together many musicians and performers from different ethnic and cultural backgrounds: African, Japanese, Chinese, Latin, French-Canadian, and Celtic. Oh my goodness… but her programming was a like fantastic dream team that I wish I could bring together for Gung Haggis Fat Choy. 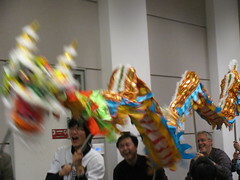 But this year, we will be adding something new… a dragon dance by the Gung Haggis Fat Choy dragon boat team! Feb 1. 09 Sunday. Free public performances. Jessica Jone 钟捷茜, Chengxin Wei 魏成新 and The Lorita Leung Chinese Dance Academy. Join us as we celebrate the Year of the Ox! Enjoy a fabulous day of live entertainment and welcome the Year of the Ox! small tents scattered around the Courtyard. 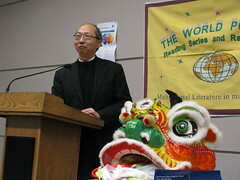 Vancouver to celebrate Chinese New Year with a world vision! 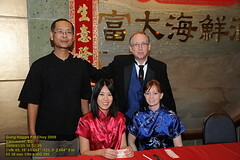 This entry was posted in Asian Canadian Cultural Events, Chinatown Vancouver, Cultural Fusion, Main Page, Multicultural events, Music, Upcoming Events, Vancouver Area Adventures, Visual Art and related events on January 25, 2009 by Todd.